If all goes well, we could soon have a battery that could solve our problem of frequently charging smartphones in a day! Researchers at the University Of Central Florida (UCF) have created a new type of battery that lasts for days with only a few seconds’ charge. 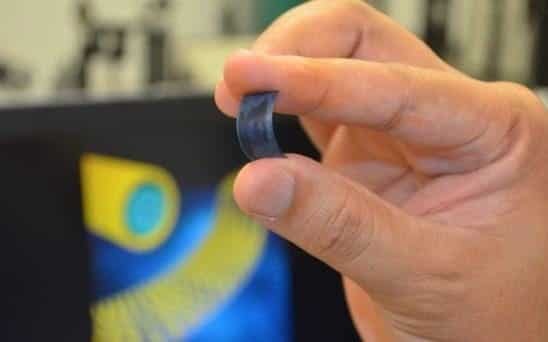 This high-powered battery will have supercapacitors that would allow it to store a large amount of energy. Where existing batteries use chemical reactions to store and discharge energy, supercapacitors charge quickly as they store energy statically on the surface of the material. They are batteries that can handle bigger flows of power and are built to cope with constant high-speed recharging and discharging. Since the new battery is a small, thin piece of flexible metal, it could also be used in electric vehicles and wearables, such as smartwatches. While lithium-ion batteries can break after about 1,500 charges, these supercapacitors can be recharged 30,000 times before degrading. They basically last between 300 to 500 full charge and drain cycles before dropping to 70 percent of their original capacity. Other estimates put the lifecycle of batteries currently on the market at a maximum of 7,000 charges. “If they were to replace the batteries with these supercapacitors, you could charge your mobile phone in a few seconds and you wouldn’t need to charge it again for over a week,” Professor Nitin Choudhary, one of the researchers, told the Telegraph in London. Supercapacitors before this were not used to make batteries, as they were too huge for standard smartphones. However, to create their prototype, the UCF researchers used tiny wires that are a nanometre thick, which are coated with a high energy shell. The core of the wires is highly conductive to allow for superfast charging. “For small electronic devices, our materials are surpassing the conventional ones worldwide in terms of energy density, power density and cyclic stability,” said Prof Choudhary. Cyclic stability refers to the number of times a battery can be fully charged and drained before it starts to degrade. SolidEnergy Systems, a company set up by Massachusetts Institute of Technology (MIT) alumni, this year created a battery with twice the energy capacity of conventional phone batteries. The company plans to make it available to smartphone manufacturers next year. While the UCF supercapacitor battery is not yet ready to be used in consumer devices, it certainly shows that progress is being made in smartphone battery technology.